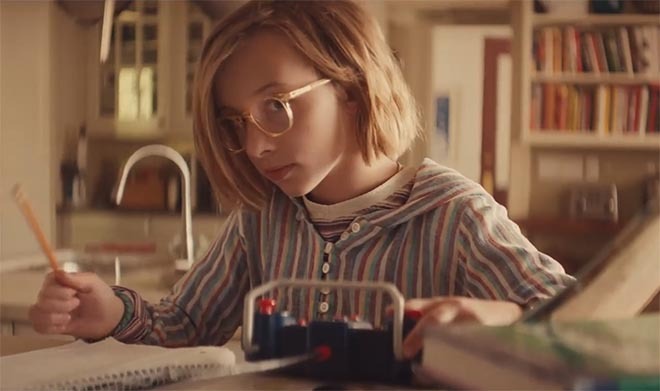 GE has launched “Meet Molly, the Kid Who Never Stops Inventing”, a commercial celebrating the engineering solutions developed at GE. We’re introduced to Molly, a young girl who comes up with brilliant solutions to problems in the home, including taking out the trash, selling Girl Guide cookies, making her bed, sweeping the floor and mowing the lawns. As she grows up, the innovation and ingenuity continue, taking us to the present time with her working as an engineer at GE. GE’s messages: “We are 300,000 people building, moving, powering and curing to accomplish one goal: making the world work better.” “GE works on things that matter. Building, powering, moving and curing the world. Not just imagining. Doing.” “Imagination and hard work make the world better”. The Meet Molly campaign was developed at BBDO New York by chief creative officer worldwide David Lubars, chief creative officer, NY Greg Hahn, executive creative director Michael Aimette, senior creative director/art director Eric Goldstein, creative director/copywriter Fred Kovey, head of production David Rolfe, executive producer George Sholley, content producer Jack Patrick, head of music production Rani Vaz. Filming was shot by director/DP Lance Acord via Park Pictures with executive producer Scott Howard, line producer Caroline Kousidonis. Editor was Paul Watts via WAX/The Quarry with assistant editor Drew Balke, executive producer Tor Adams, and producer Annabelle Cuthbert. Visual effects were produced at A52 by producer Kim Christensen, lead CG artist Andy Wilkoff, conform artist Pat Murphy. Graphic design was produced at Elastic by Kim Christensen. Colourist was Tim Masick at Company 3 with producer Rochelle Brown. Sound was designed at One Thousand Birds. Audio post was done at Sonic Union by engineer Michael Marinelli and producer Justine Cortale. Music is “Di-Gue-Ding-Ding” by Michel Legrand.